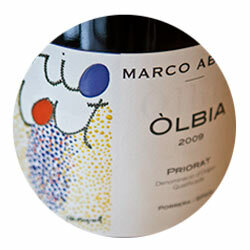 Since releasing our Priorat guide a few months ago, we’ve had the chance to taste some of the new vintages that have come out after publication which of course has been a delight, especially when it comes to Marco Abella. One of the relatively new cellars to the village of Porrera in Priorat and built upon the foundations of a long family tradition, watching the evolution of their wines has been fantastic. Their reds are all outstanding and we were thrilled to have them served at a recent presentation of our guide in Barcelona. But, it also allowed us the chance to taste the new vintage of their very limited production (less than 600 bottles) white wine called, Òlbia, which in addition to making only a few bottles, they only make in optimal years. The 2009 was the vintage was tasted last Fall and that is included in the book. A unique wine, we awarded it as one of our picks of the region. The 2012 vintage follows along similar lines, but it adds in a touch of Viognier to the mix which, along with the Macabeu and White Grenache has made for one of the more stellar white Priorat wines that we’ve tasted to date. It is completely different, but right up there on our personal podium of favorite Priorat whites with the Abracadabra from Trossos del Priorat. We’ll be including the new tasting notes along with others in a rapidly forthcoming update to the digital version of Priorat. Òlbia 2012 shows off aromas with a good deal of cantaloupe and bitter melon that tickles the nose and invites multiple inhalations to take in. It has an initial aroma of lychee and even tropical fruits that are extremely pleasant. The Viognier in this vintage helps pull together the nose and articulate the wine as it opens. The body is wonderfully bright with crisp freshness that is overall dominated by the Macabeu aspects of white peach and melon that comes in from the nose. Delicious.